The current champions Chennaiyin FC take the field for their final home game of the 2018-19 ISL season as they host Jamshedpur FC at the Jawaharlal Nehru Stadium in Chennai on Saturday. There hasn't been much for Chennaiyin FC to look back at the end of the season. An edition regarded as 'over-confident' was a huge blow to the title holders as they could register only two wins throughout these months. Chennai's two good days at the office were against Pune City in November and Bengaluru FC earlier this month. However, the management would now be aiming at a decent AFC Cup performance starting on 6th March. The new signings hopeful of taking away the club's worries are to rise to the standards at least at this end. Placed at the bottom with 8 points, there are hardly any chances for John Gregory's side to escape the bottom space. 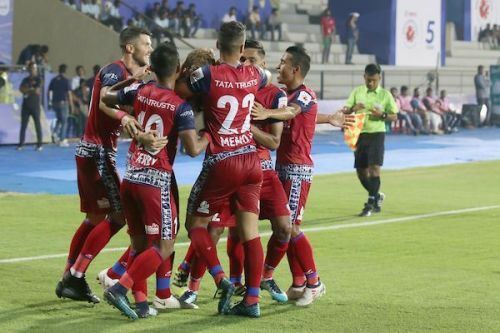 Jamshedpur FC wouldn't want to repeat their mistakes from previous season this year. After a decent outing, they came close to the playoff spot, but couldn't make it to the postseason and finished 5th on the table. At present, JFC is in the same position with a similar backdrop. They have 23 points from 16 games and are 4 points behind Mumbai City just before them. Now, Cesar Ferrando's chances don't depend on his team's results alone, but those of Mumbai City and NorthEast United as well. In this testing situation, even a draw will lead to an exit for Jamshedpur FC. Gregory Nelson serves a one-match suspension following the fourth yellow of the season, against Blasters. Tim Cahill is the name on the injury list for Jamshedpur FC. Chennaiyin FC, if having any hope, would pin the same on the shoulders of Raphael Augusto and Jeje Lalpekhlua. Two stars from the previous seasons, who failed miserably this year, have now shown signs of an improved display on the field. While Jeje would be aiming to get on the scoreboard for a second time this season, Augusto would be feeding the strikers with crucial through balls. If this combo gets going, Chennai might have a temporary solution to their worries. The two men for JFC with similar duties are Mario Arques and Carlos Calvo. While the former has 2 goals and 3 assists this season, Calvo has 3 goals and 5 assists to his name. Both the Spanish midfielders have played crucial roles throughout the tournament and would again be key at supplying the attacking balls forward. Calvo, deployed at an attacking position, will have the duty of the keeping the CFC midfield distracted. A result for this fixture wouldn't be too difficult and is expected to be a one-sided match. The form Chennaiyin FC are at and the current situation of Jamshedpur FC might force them to strive for a win. With an extra patch of attack expected from the visitors, the match is predicted to go in favour of them.